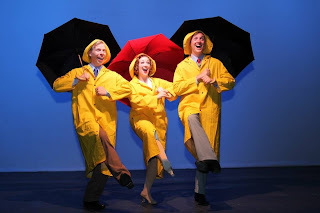 For the first musical of its 2013-2014 season, Bloomington Civic Theatre chose Singin' in the Rain, based on one of the most popular movie musicals of all time. Having never seen the movie (I'm a theater geek, not a movie geek), I was less excited about this one than the rest of their season, which includes the epic Les Miserables, the adorably hilarious 25th Annual Putnum County Spelling, and the stage classic Gypsy. But I really enjoyed Singin' in the Rain, which bodes well for the rest of the season. Director and choreographer Michael Matthew Ferrel incorporates some tricky technical elements into the story about the end of silent films and the beginning of "talkies," and, as expected, provides some wonderful choreography that is energetically performed by the young and talented cast. 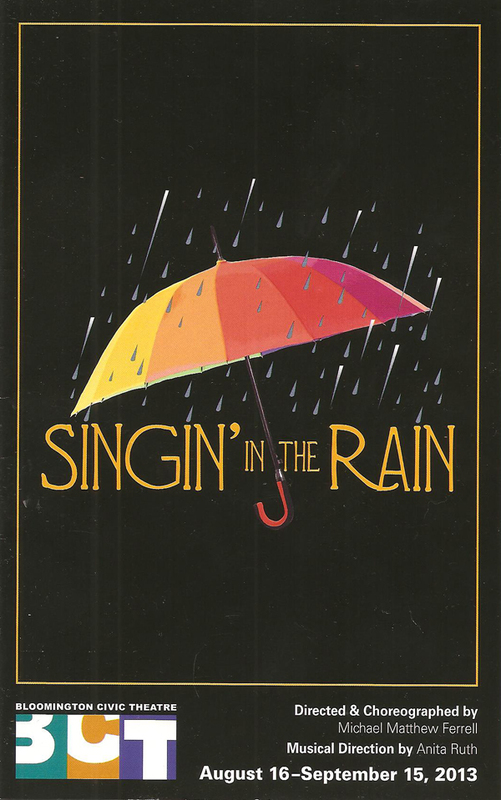 The classic movie musical may not be my favorite kind of musical, but this one is a lot of fun and well done. Let's start with the choreography. There is of course the iconic title number, in which Hollywood actor Don dances in the rain and doesn't mind because he's in love with his new co-star Kathy. Real water pours out of a spout on the side of the stage, while confetti falls from the ceiling and looks like rain as it catches the light. It's a magical and delightful scene. The "Broadway Melody" montage is also a highlight (even if it has nothing to do with the musical or musical-within-a-musical plot), with lots of tap dancing. The dancing is so great it continues into the longest curtain call ever! Second, the technical elements. Since the plot centers around silent film actors transitioning to talking film actors (with varying degrees of success), it's important to see those films, and we do. Previously filmed material is shown on a screen onstage, with Music Director Anita Ruth playing along live just like they did in the olden days of movies. We see a complete (short) silent film cut together with title cards, and later a talking film with purposely bad sound. They're very well done and entertaining, and essential to the storytelling. graduate and welcome newcomer to the Twin Cities theater scene. With her gorgeous voice, dancing talent, and likeable stage presence, I have a feeling we'll be seeing a lot more of her on Twin Cities stages in the near future. For comic relief we have the delightful Rachel Weber as Lina, the silent film star with the unbearable voice (but don't let her fool you, she has a lovely voice of her own). Is it wrong that I found myself rooting for Lina? "What's wrong with me?" Nothing, indeed! Last but not least is Jeffrey C. Nelson, who is perfectly cast as the clownish sidekick Cosmo. He has a rubber face and body and knows how to "Make 'em Laugh." Lastly, I can't write about a BCT show without mentioning the fantastic full (20+ piece) pit orchestra led by Anita Ruth, which warms my former-pit-player heart. Makes a girl wish she had never given up the clarinet. BCT always puts on a good quality show, and Singin' in the Rain is no exception. Next up: Les Miserables, starring one of my favorite local actors Dieter Bierbrauer as Jean Valjean. But before that, I'm going to my first play at the BCT Black Box Theater, my second favorite math play Proof.